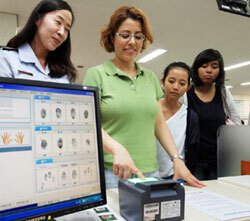 The Ministry of Justice has announced that foreigners who come to Korea and stay for more than 90 days are now required to submit their fingerprints and mug shots. The fingerprint registration system was abolished in 2003, but the ministry revised the immigration control law last year to help curb the growing number of crimes committed by foreign nationals. The ministry is also advising foreigners already living in Korea to register their personal information from next January. The Korean government will use the information to help in criminal investigations and improve social welfare benefits for registered foreigners.